This recipe makes 6 small, slightly sweet, slightly tart mini pies. 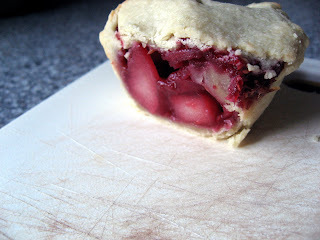 The combination of slightly stewed apples and raspberries makes for a interesting filling that is less sweet then the conventional apple pie filling. 1. To a food processor add the flour, sugar and butter and combine until the mixture looks like fine breadcrumbs. 2. Add iced water until a smooth dough is formed. 3. Remove from the food processor and knead for a little bit on the bench and then roll it into a ball and wrap in plastic. 4. Refrigerate for 30 min. 1. In a medium saucepan, put the apples with the lemon juice (add perhaps 1 Tbs of water as well), add the cloves, and cinnamon stick. Cook over medium heat for around 10 min. 2. Add the raspberries, lemon zest and sugar and mix until the sugar has dissolved. 3. In a small bowl combine the cold water and corn starch. 4. Add this corn starch to the apples and raspberries and continuously mix until the mixture has thickened. 1. Grease 6 muffin tins and preheat the oven to 400F. 2. Take the pastry out of the fridge and roll out on a lightly floured bench to 1/8 inch (3mm) thick. 3. Cut out a circle and fit this into the muffin tins. 4. Evenly divide the filling between the tins. 5. Cut out from the pastry tops to the mini pies, and using a pastry brush wet the sides of the pie bases and attach the pie tops on top (squeezing the pastry together with your fingers and pinching the pastry so that it sticks together). 6. Cut a small slit in the top of the pie. 7. If you like you can whisk an egg in a small bowl and, using a pastry brush, brush on the egg wash and then you can sprinkle some brown sugar. 8. Bake for 20-25 min until the pastry is golden. Taken from Donna Hay "Modern Classics book 2" pp. 157 and 160.
hello. hello. I just stumbled upon your blog and I must say... Beautiful! Your pictures are stunning. I'll be back here, and often! Hi. These look so amazing! I can't wait for my rhubarb to come up so I can use that in place of the apples! Beautiful colors and a wonderful combination of fruit flavors. The apples in the cross section look so pretty. 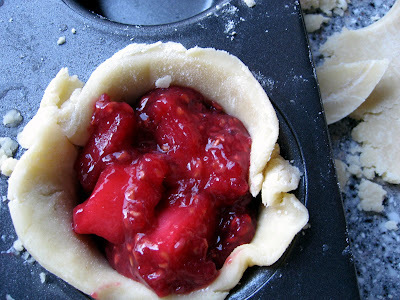 I used mini tart pans before, but I never occurred to me to use muffin tins. I like the effect. cakebrain: thank you - they were yummy! joy the baker: I looked at your blog as well - I love those baby cakes you made. Zoe: Rhubard would be wonderful - the original recipe used rhubarb and pears in place of the apples and raspberries. amara: I thought it was a great idea as well. I did have some issues fitting the bases in due to the size of the tins - but overall they came out easily and it was nice to have individual servings.